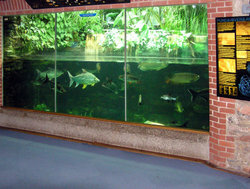 An aquarium (plural aquariums or aquaria) is a vivarium, usually contained in a clear-sided container (typically constructed of glass or high-strength plastic) in which water-dwelling plants and animals (usually fish, and sometimes invertebrates, as well as amphibians, marine mammals, and reptiles) are kept in captivity, often for public display; or it is an establishment featuring such displays. 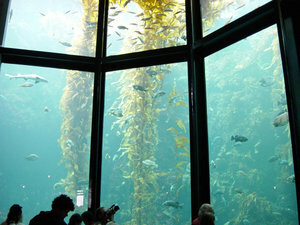 Aquarium keeping is a popular hobby around the world, with about 60 million enthusiasts worldwide. From the 1850s, when the predecessor of the modern aquarium was first developed as a novel curiosity, the ranks of aquarists have swelled as more sophisticated systems including lighting and filtration systems were developed to keep aquarium fish healthy. Public aquaria reproduce the home aquarist's hobby on a grand scale â€” the Osaka Aquarium, for example, boasts a tank of 5,400 mÂ³ (1.4 million U.S. gallons) and a collection of about 580 species of aquatic life. A wide variety of aquaria are now kept by hobbyists, ranging from a simple bowl housing a single fish to complex simulated ecosystems with carefully engineered support systems. Aquaria are usually classified as containing fresh or salt water, at tropical or cold water temperatures. These characteristics, and others, determine the type of fish and other inhabitants that can survive and thrive in the aquarium. Inhabitants for aquaria are often collected from the wild, although there is a growing list of organisms that are bred in captivity for supply to the aquarium trade. The careful aquarist dedicates considerable effort to maintaining a tank ecology that mimics its inhabitants' natural habitat. Controlling water quality includes managing the inflow and outflow of nutrients, most notably the management of waste produced by tank inhabitants. The nitrogen cycle describes the flow of nitrogen from input via food, through toxic nitrogenous waste produced by tank inhabitants, to metabolism to less toxic compounds by beneficial bacteria populations. 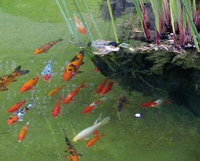 Other components in maintaining a suitable aquarium environment include appropriate species selection, management of biological loading, and good physical design. The word aquarium itself is taken directly from the latin aqua, meaning water, with the suffix -rium, meaning "place" or "building". The keeping of fish in confined or artificial environments is a practice with deep roots in history. Ancient Sumerians were known to keep wild-caught fish in ponds, before preparing them for meals. In China, selective breeding of carp into today's popular koi and goldfish is believed to have begun over 2,000 years ago. Depictions of the sacred fish of Oxyrhynchus kept in captivity in rectangular temple pools have been found in ancient Egyptian art. Many other cultures also have a history of keeping fish for both functional and decorative purposes. The Chinese brought goldfish indoors during the Song dynasty to enjoy them in large ceramic vessels.